Posted on March 31, 2019 by Eric Bonnici wrote in Tourism News. It has 0 Comment. 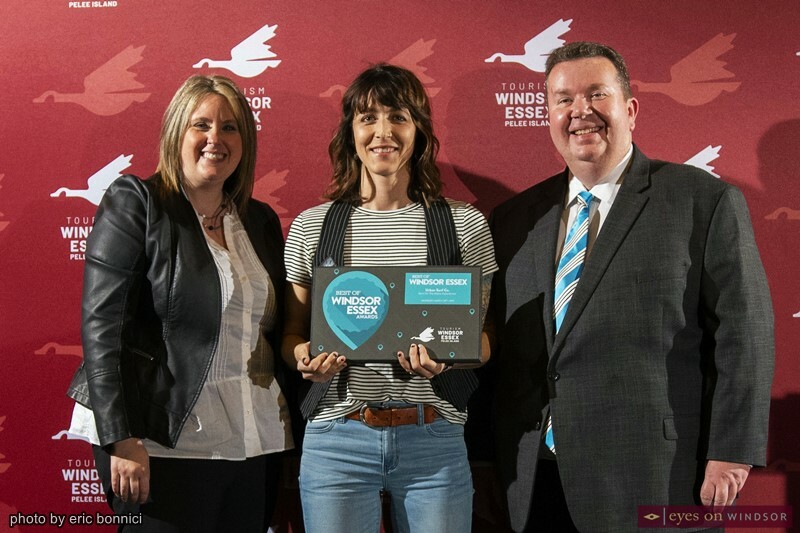 Tourism Windsor Essex Pelee Island announced the winners of the fourth edition of the Best of Windsor Essex Awards, based on public nominations, during a special ceremony held at St. Clair Centre For The Arts last Thursday (March 28). The voting ran from February 4th through February 24th, 2019 with the goal of putting together the most comprehensive list of the “best things to see and do” in the region. Just for voting, the public was entered into to a draw for a chance to win a grand prize featuring a $500 shopping spree at some of the Best of Windsor Essex Award winners. The lucky winner was Mike Soda who was at the awards ceremony to claim his prize. 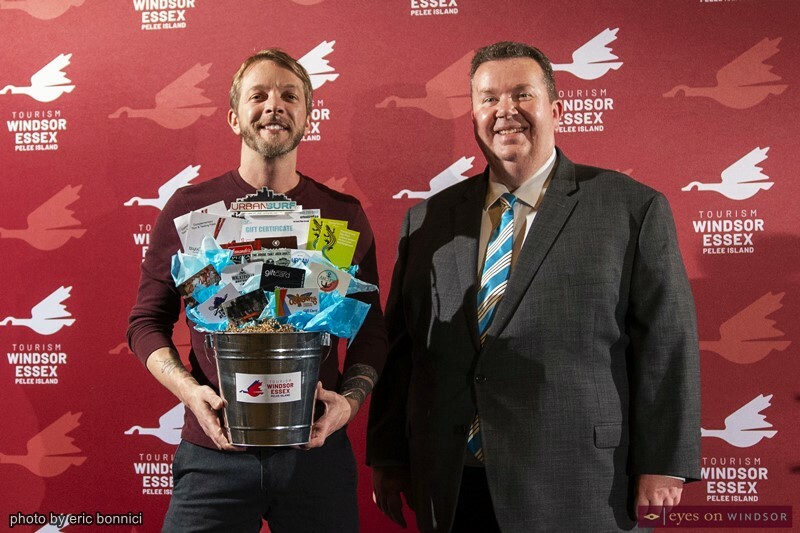 Mike Soda (left), winner of the Tourism Windsor Essex and Pelee Island Best of Windsor Essex Shopping Spree Grand Prize with Gordon Orr at St. Clair College Centre For The Arts on March 28, 2019. Photo by Eric Bonnici / Eyes On Windsor. This popular social media campaign drew a tremendous response where Windsor Essex businesses received over 12,400 nominations, with 232 finalists across 46 awards. Voting categories included the best in: Arts & Entertainment, Attractions & Events, Drink, Food, Outdoor Adventure, Shopping, Stay, and Photo Op. 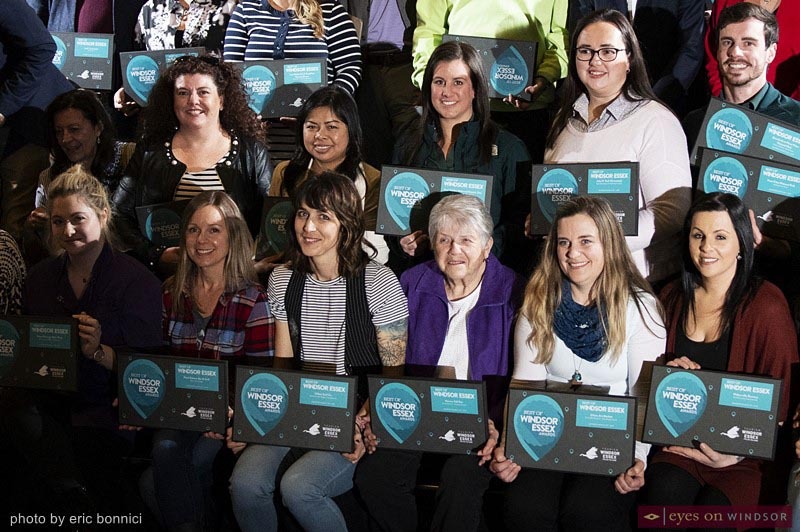 In addition to commemorative plaques, a letter of congratulations and bragging rights, winners will also be mentioned in Tourism Windsor Essex’s 2019/20 Official Visitor Guide and at bestofwindsoressex.ca. This specifically designed site will feature a mini-profile and photo of each winner and a highlight of the top 5 finalists per category. 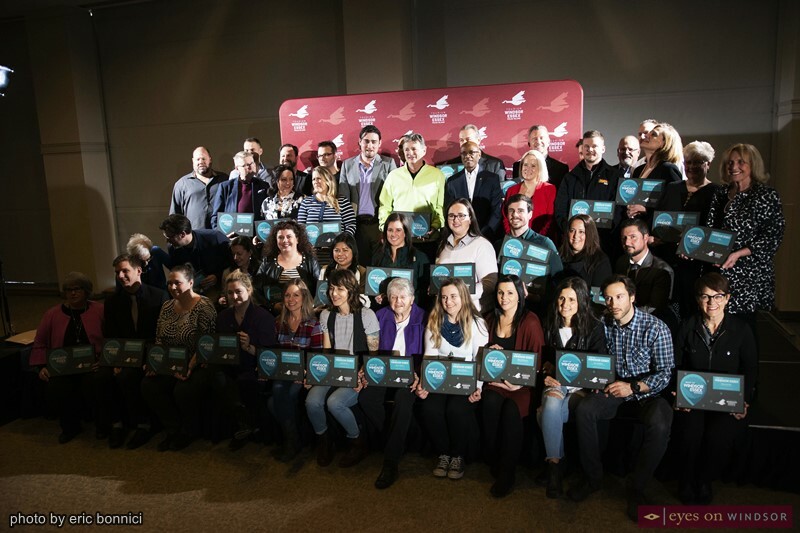 Tourism Windsor Essex Pelee Island Best of Windsor Essex Awards Winners gathered for a group photo at St. Clair College Centre For The Arts on March 28, 2019. Photo by Eric Bonnici / Eyes On Windsor. Finalists and winners will be able to use this campaign to differentiate their business, increase their visibility, validate their achievements, and act as a strong testimonial of their offerings. Furthermore, this campaign has created an authentic list that is expected to resonate with visitors, giving Tourism Windsor Essex the opportunity to highlight some of the best of what the region has to offer. 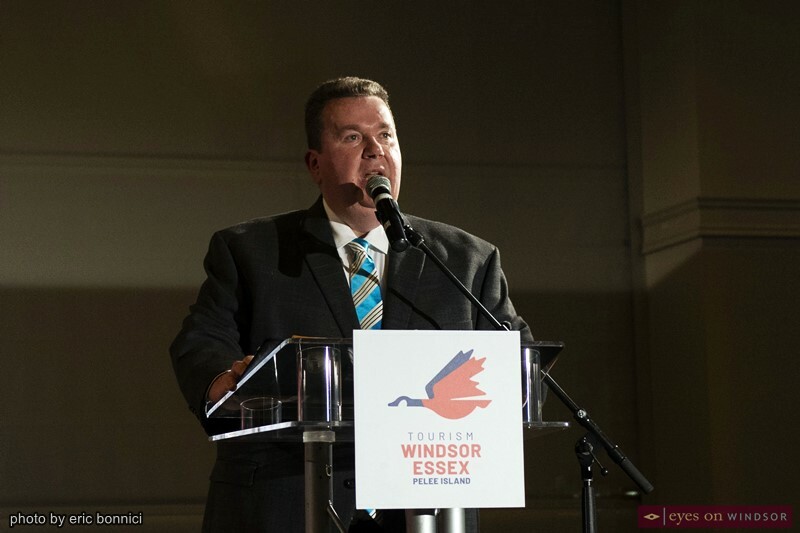 Gordon Orr, Chief Executive Officer Tourism Windsor Essex Pelee Island, speaking during the Best of Windsor Essex Awards at St. Clair Centre for The Arts on March 28, 2019. Photo by Eric Bonnici / Eyes On Windsor. 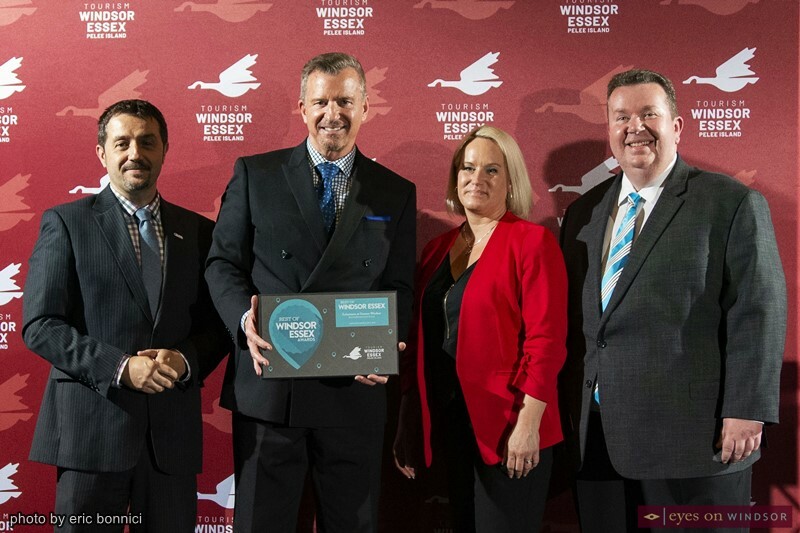 Caesars Windsor receiving the Tourism Windsor Essex and Pelee Island Best of Windsor Essex Award for Best Entertainment Venue at St. Clair College Centre For The Arts on March 28, 2019. Photo by Eric Bonnici / Eyes On Windsor. Finalists included Chiaroscuro Artists’ Supplies & Showroom, Gibson Gallery, Leamington Arts Centre, and Merlis’ Eatery & Beverage House. Finalists included Capitol Theatre Windsor, Chrysler Theatre, Leamington Amphitheatre, and Phog Lounge. Finalists included Canadian Transportation Museum & Heritage Village, Chimczuk Museum, Park House Museum, and Pelee Island Heritage Centre. Finalists included Edmunds Towers School of Dance, Korda Artistic Productions, University Players, and Windsor Light Music Theatre. 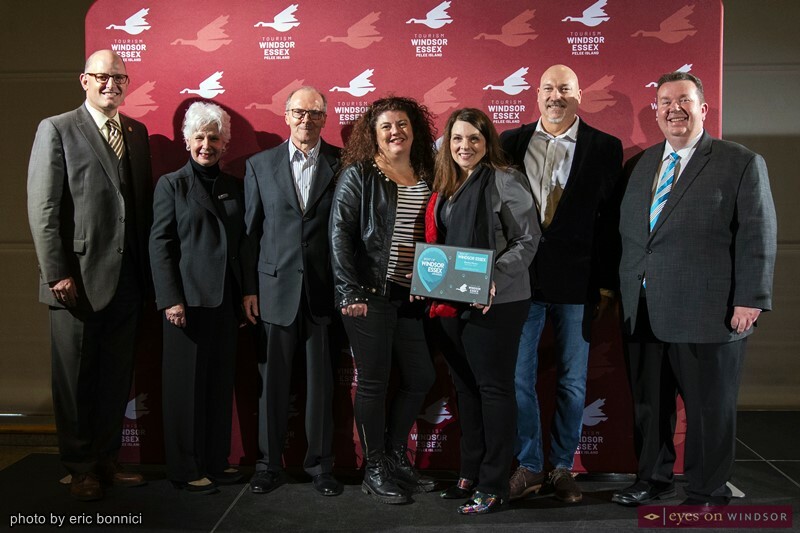 Finalists included Grapevine Tours, J.P. Wiser’s Distillery Experience, Rum Runners Tour, and Windsor Adventure Inc.
Finalists included Adventure Bay Family Water Park, Point Pelee National Park, Sky one Trampoline Park, and Zap Zone Fun Centre. Finalists included Chances Gaming Lounge, Leamington Raceway, Paradise Gaming Centre, and Wizards of Walkerville. Finalists included Amherstburg Freedom Museum, Canadian Transportation Museum & Heritage Village, John R. Park Homestead, and Willistead Manor. Finalists included Art at the Marina Leamington, Art by The River, Walkerville Art Walk, and Windsor International Film Festival. Finalists included Amherstburg River Lights, Combersation Holiday Event, Kingsville Fantasy of Lights, and Walkerville Holiday Walk. Finalists included Essex Fun Fest, Ford Fireworks, LaSalle Stawberry Festival, and Tecumseh Corn Festival. Finalists included Amherstburg Rotary Rib Festival, Taste of Tecumseh, Windsor Craft Beer Festival, and Windsor Rib & Craft Beer Festival. Finalists included Chaps & Spurs Country Festival, Hogs 4 Hospice, Island Unplugged Music Festival, and Kingsville Folk Music Festival. Finalists included Amherstburg Gone Car Crazy Show, Buskerville Windsor, Dropped on Drouillard, and Stroll the Street Belle River. 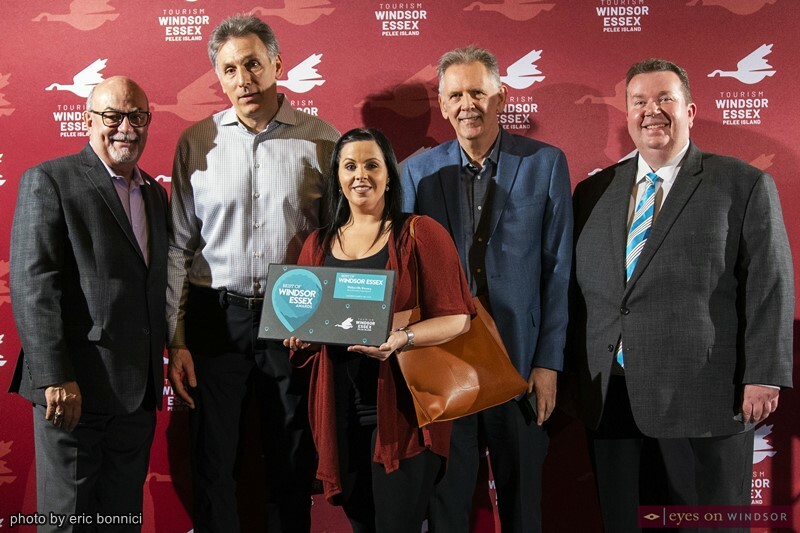 Walkerville Brewery receiving the Tourism Windsor Essex and Pelee Island Best of Windsor Essex Award for Best Brewery Experience at St. Clair College Centre For The Arts on March 28, 2019. Photo by Eric Bonnici / Eyes On Windsor. Finalists included Blind Owl, F&B Walkerville, Grand Cantina, and Jack’s Gastropub. Finalists included Craft Heads Brewing Co., FRANK Brewing Co., GL Heritage Brewing Co., and The Grove Brew House. Finalists included 30mL Coffee Co., Caffeine & Co., Merlis’ Eatery & Beverage House, and Taloola Café. Thai Palace receiving the Tourism Windsor Essex and Pelee Island Best of Windsor Essex Award for Best Asian Restaurant at St. Clair College Centre For The Arts on March 28, 2019. Photo by Eric Bonnici / Eyes On Windsor. Finalists included Grand Cantina, Kabobgy, Mare Nostrum, and Mi Casita. Finalists included Jade Chinese Cuisine, Koi Sushi, Pomegranate Chinese Cuisine, and Shin Shin. Finalists included Garfield’s, Stacks, The Lumberjack, and TOAST Restaurant. Finalists included Barrel House Draught Co. & Grill, Crave Family Grill & Pub, Jack’s Gastropub, and Motor Burger. Finalists included Busker’s Submarine, Slinky’s Ice Cream, Stop 26 Ice Cream & More, and Waterfront Ice Cream. 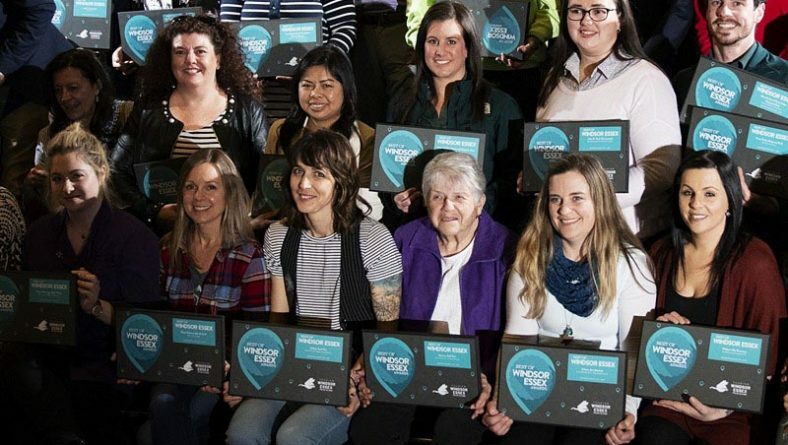 Finalists included Craft Beer & Chocolate Pairing at GL Heritage Brewing Co., EPIC March Mac’ness, Iron Kettle High Tea, and Windsor Eats Dinner on a Pier. Finalists included O’Sarracino Trattoria & Wine Bar, Piccolo’s Pizza & Pasta House, Riccardo’s Italian Restaurant, and The Cook Shop. Finalists included Birdie’s Perch, Paula’s Fish Place, Sandbar Waterfront Grill, and Wolfhead Distillery. Finalists included Antonino’s Original Pizza, Brenko’s House of Pizza, Capri Pizzeria, and Oven 360. Finalists included Birdie’s Perch, Eighteen Twelve Putinerie, Phog Lounge, and Simon’s Prime Hamburgers. Finalists included Lakeside Bakery, Little House of Cupcakes, Riverside Pie Cafe, and Stiemar Breads Windsor. Finalists included Healthy Mama, Merlis’ Eatery & Beveragehouse., Nooch Vegan Eatery, and Taloola Cafe. Finalists included Bull & Barrel Urban Saloon, Hurricanes Pub and Grill, John Max Sports & Wings, and Loose Goose Resto Pub & Lounge. 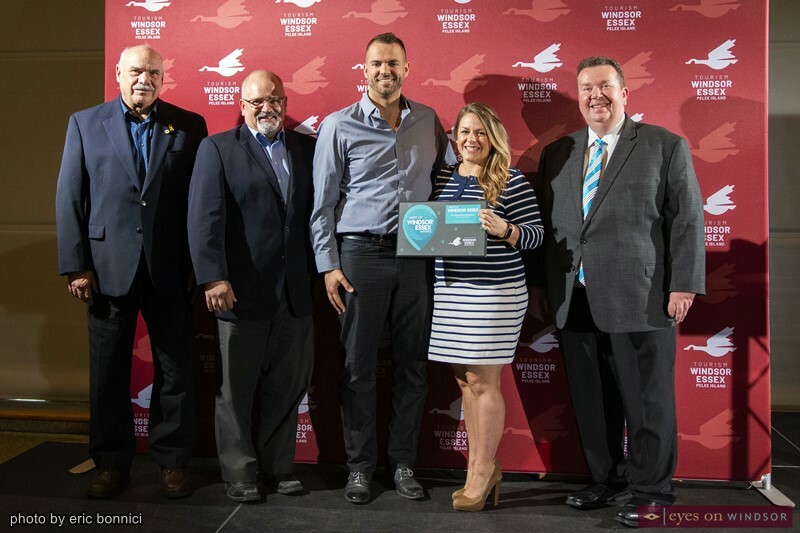 Urban Surf Co. receiving the Tourism Windsor Essex and Pelee Island Best of Windsor Essex Award for Best On The Water Experience at St. Clair College Centre For The Arts on March 28, 2019. Photo by Eric Bonnici / Eyes On Windsor. Finalists included Holiday Beach Conservation Area, Jack Miner Bird Sanctuary, Ojibway Park, and Pelee Island Bird Observatory. Finalists included Ambassador Golf Club, Oxley Beach Golf Course, Roseland Golf & Curling Club, and Sutton Creek Golf Club. Finalists included Pelee Island Charters, Pelee Wings Paddleboards Shop, Windsor Adventure Inc., and Windsor River Cruises. Finalists included 42 at Point Pelee National Park, Bert Weeks Memorial Fountain, Rotary Centennial Park, and Windsor Sculpture Park. Finalists included Coventry Gardens, Dieppe Gardens, Jackson Park, and Point Pelee National Park. Finalists included ERCA Greenway, Malden Park, Ojibway Park, and Point Pelee National Park. Walkerville BIA. 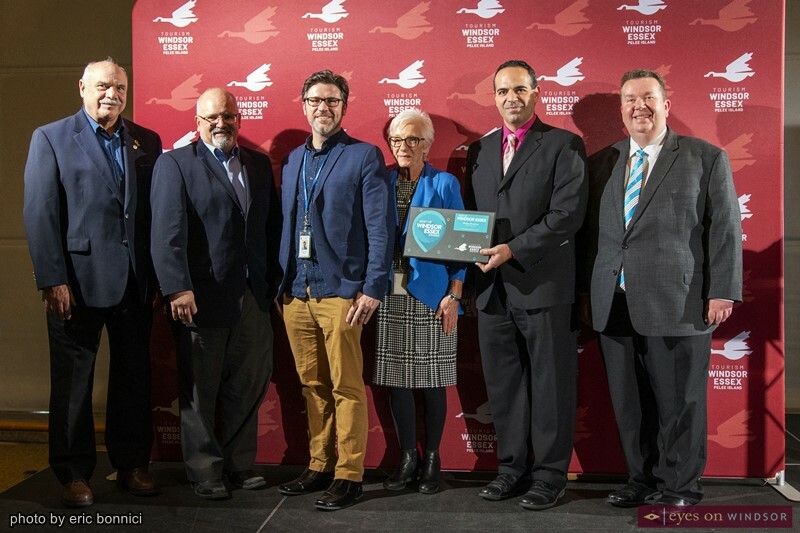 receiving the Tourism Windsor Essex and Pelee Island Best of Windsor Essex Award for Best Shopping District at St. Clair College Centre For The Arts on March 28, 2019. Photo by Eric Bonnici / Eyes On Windsor. Finalists included Attic Treasures, Harrow Antique and Collectible Centre, and The Dusty Loft Antiques & Collectables. Finalists included Amherstburg, Kingsville, Ottaway Street, and Wyandotte Street. Finalists included Dutch Boys Chocolate, Michael Difazio Reclaim Artistry, Ocean Bottom Soap Company, and Soutwest Shores. Iron Kettle B&B. 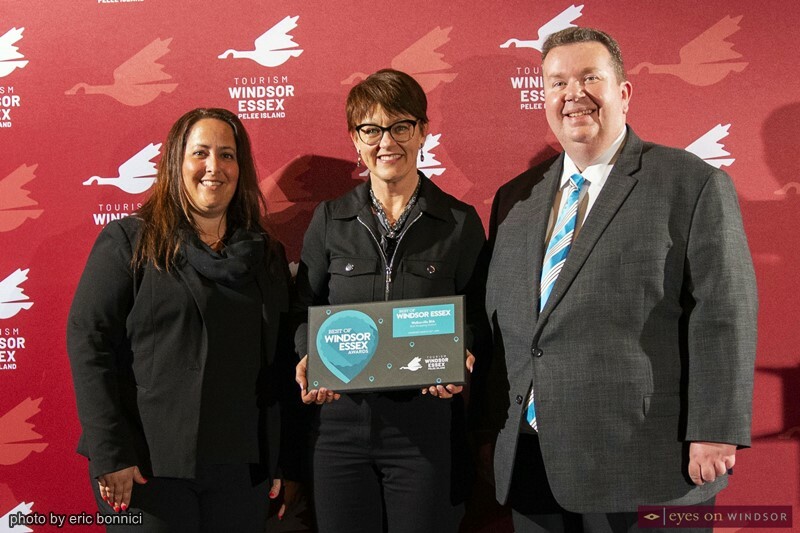 receiving the Tourism Windsor Essex and Pelee Island Best of Windsor Essex Award for Best Bed & Breakfast at St. Clair College Centre For The Arts on March 28, 2019. Photo by Eric Bonnici / Eyes On Windsor. Finalists included A Hidden Gem B&B, Inn 31 at Jack’s Gastropub, Kingsville House Bed & Breakfast, and Wandering Dog Inn. Finalists included East Park Campground, oTENTik at Point Pelee National Park, Sturgeon Woods Campground, and Willowood RV Resort. Finalists included Charlies Retreat, Escape by the Lake, Holiday Beach Cottage, and Oxley Beach House. Finalists included Best Western PLUS Leamington, Seacliffe Inn, The Grove Hotel, and Towneplace Suites by Marriott. 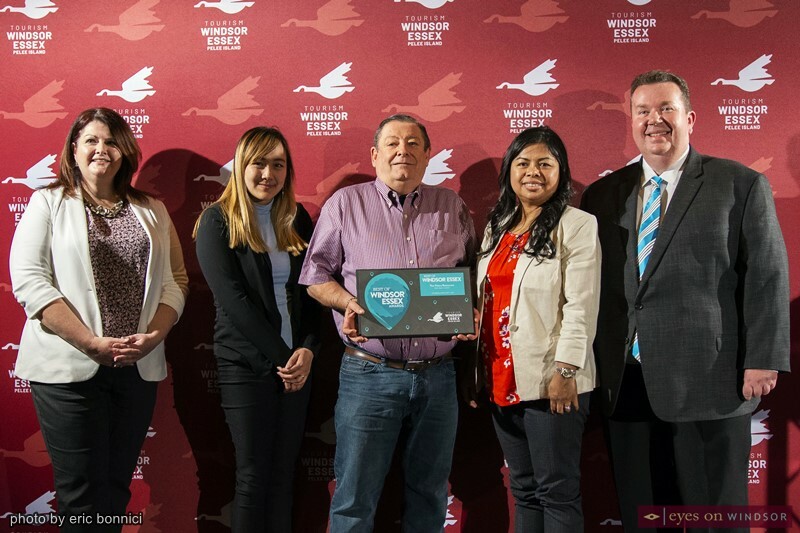 City of Windsor Waterfront receiving the Tourism Windsor Essex and Pelee Island Best of Windsor Essex Award for Best Photo Op at St. Clair College Centre For The Arts on March 28, 2019. Photo by Eric Bonnici / Eyes On Windsor. Finalists included Great Canadian Flag, Jackson Park, Kings Navy Yard Park, Lakeside Park, Leamington Marina, Peace Fountain, Pelee Island Light House, Point Pelee, and Willistead Manor. The full photo gallery of award winners can be found the Eyes On Windsor Facebook Page.